based on their merit in qualification, previous experience and documents verification. 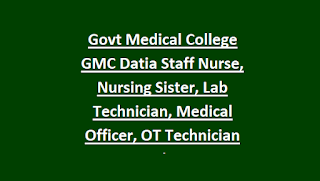 There are total 142 vacancies in this GMC Datia Medical College recruitment 2018 of Staff Nurse, Nursing Sister, Medical Officer, Lab Technician Posts. Check the below information for more about how to apply, post wise vacancies, available posts of GMC Datia Medical College Recruitment 2018. 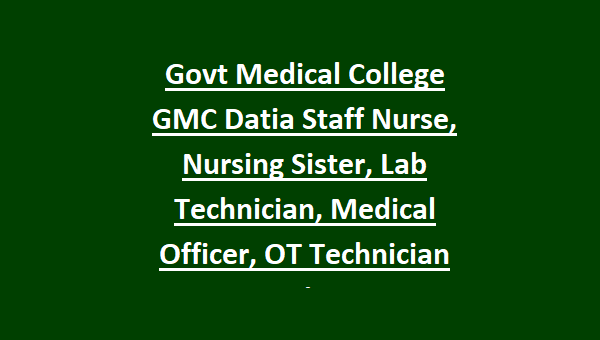 There are total 142 vacancies in this GMC Datia Recruitment 2018. For post wise qualifications refer official notification which is given below. Candidates will be selected for this GMC Datia vacancies based on merit in their educational qualifications, interview and previous work experience. Only short listed candidates will get eligible for interview or written exam. Admit Card will be available in official website of GMC Datia, Whenever it is released. Interested and eligible candidates of Madhya Pradesh state can apply for this GMC Datia jobs. Last date to reach the application form to GMC Datia is 18-10-2018.